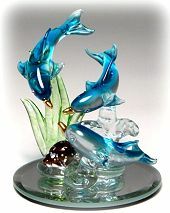 Three lively glass Blue Dolphins leap and play in the sea surf. This hand spun glass figurine can be illuminated with an LED light base and is a popular gift or party favor. A group of three dolphins with gold accented noses chat among the sea grass near a bright colored sea shelled snail. This hand made spun glass figurine includes a beveled round mirror base that can be placed over an LED light base for added effect. A colorful Dolphin, Sea Turtle and Gold Tiger Fish gather around a frosted Sea Anemone, creating an irresistible spun glass sculpture. This arrangement sits on a round beveled mirror base and adds whimsy and wonder to any decor. 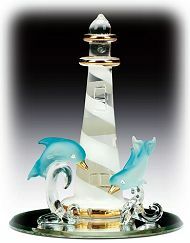 Gold accented Lighthouse glass figurine has a crystal lantern with two lively blue dolphins cavorting on waves. 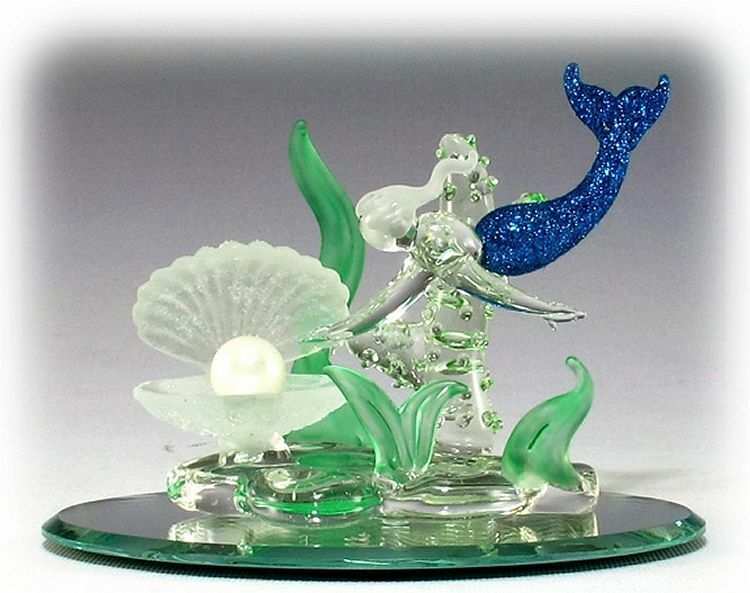 This glass nautical figurine is set on a round beveled mirror base can be placed over an LED light base for added effect. Sparkling, transparent rainbow hued tropical Angel fish swims around crystalline pastel colored anemones and sea grasses. This hand crafted spun glass figurine includes a beveled round mirror base and a glossy gift box and can be lit up on an LED light base. A lovely mermaid with a sparkling blue tail is drawn to a frosted oyster with a large pearl hidden within sea grass. The arrangement sits on an oval beveled glass mirror base and is a must have for any mermaid collector. 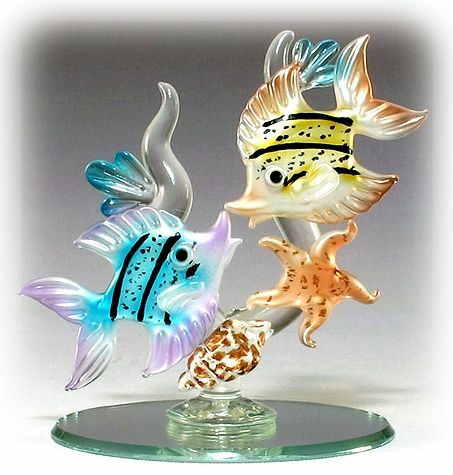 Gorgeous pair of colorful glass tropical fish swim near a sea shell and starfish. 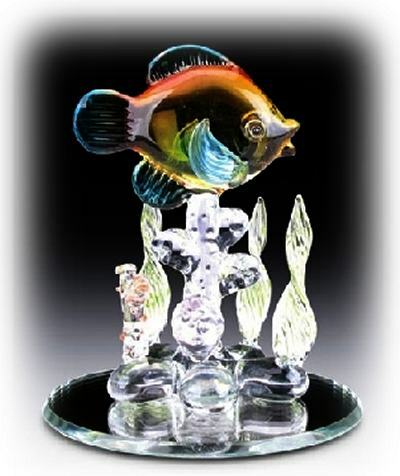 This hand made spun glass figurine includes a beveled round mirror bass that can accommodate an LED light base and a glossy gift box. 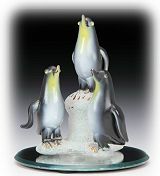 Lovable Penguin family on ice spun glass figurine. The penguin's lifelong devotion to partner and family embodies the soul of true love. 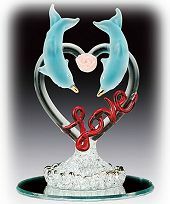 This hand made spun glass figurine with round beveled mirror base can be placed over an LED light base for added effect. 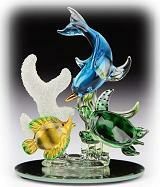 A Mama and Baby Sea Turtle enjoy a swim together among the sea grass in this endearing spun glass sculpture. 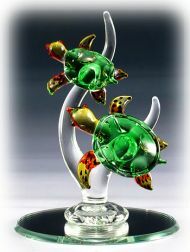 The green and amber Sea Turtles are set on a beveled round mirror base suitable for an LED light base. 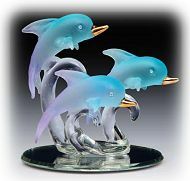 Three playful porpoises with gold accented noses in frosted blue and purple glass are the subject of this delightful figurine! 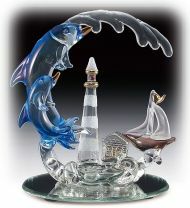 The three Dolphins create a leaping ballet over curling glass waves. This hand made spun glass figurine is set on a beveled round mirror base with clear center for an LED light base. Frosted Lighthouse glass figurine has gold accents and ruby crystal lantern with two leaping dolphins and a frosted seagull finishing this charming seaside sculpture. This piece is set on a round beveled mirror base can be placed over an LED light base for added effect. Bring the coastal life home with this nautical glass tableau of leaping Dolphins on a wave beside a frosted Lighthouse and base and clear glass sail boat with gold accents. This piece is set on a 4" W round beveled mirror base and can used with an LED light base for added effect. 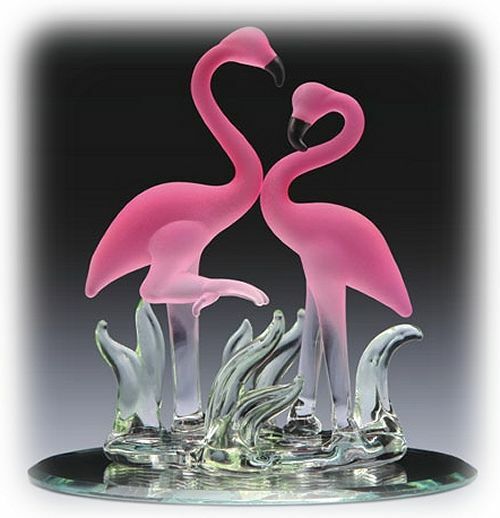 Tropical spun glass Pink Flamingo Pair stand over a reflective oval pond mirror base with green and clear foliage accents. This hand made spun glass figurine is a perfect gift or party favor. Semi translucent spun glass Pastel Pink Flamingos ponder over a conch shell with clear green lake grass accents on a reflective pond mirror base. This spun glass figurine is set on an oval beveled mirror base. 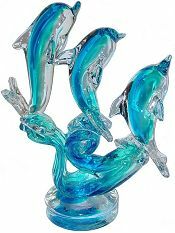 Large Murano style hand crafted 8" high Three Leaping Dolphins art glass sculpture in sparkling clear and sapphire blue hues. 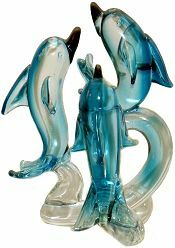 The playful Dolphins dance on three soaring waves that rest on a heavy blue and clear glass round pedestal in this Murano style art glass sculpture. 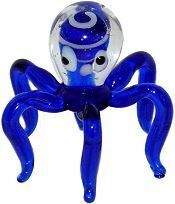 Charming cobalt blue glass octopus makes a big splash!. 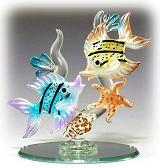 This Murano style glass figurine can be illuminated with an LED light base and is a welcome gift or desk ornament. 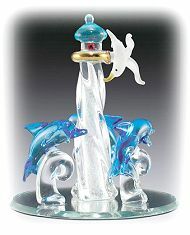 Frosted art deco style glass waves are flanked by three spun glass leaping dolphins in this exquisite creation. An oval mirror base and gold accents enhance this unusual piece. 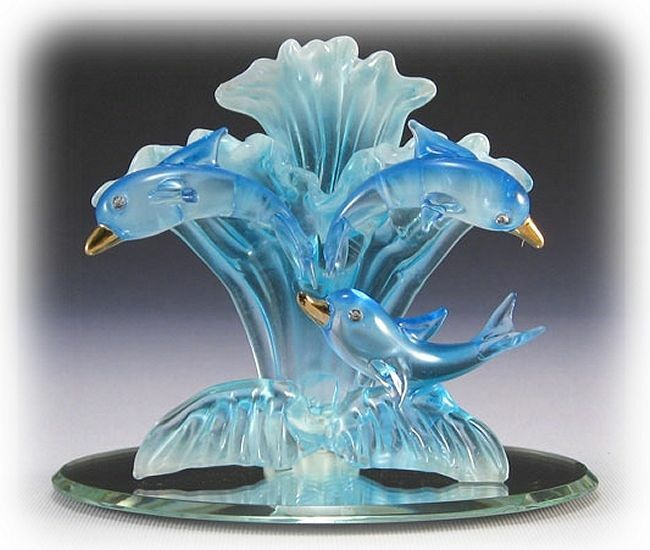 A trio of frosted blue and lavender dolphins with crystal eyes and gold toned noses, leap over blue stylized waves in this lovely spun-glass offering. The arrangement sits on an oval glass mirror base. 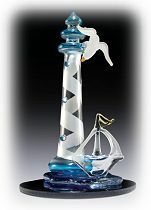 Sleek Light House glass figurine has blue tower and base with a frosted seagull and clear glass sail boat finishing this quaint marine ensemble. This piece is set on a round beveled mirror base and can used with an LED light base for added effect.